After successfully defeating her rivals to become Queen of England, Elizabeth I (Cate Blanchett) faced a life largely of loneliness and stress, both of which increased as she refused to marry and seal an alliance of protection, leaving herself open to attack from the nations of Europe. Nearly bankrupt and with its military power dwindling, they faced invasion by the mightiest naval force ever assembled, the Spanish Armada. The follow up to1998’s highly successful “Elizabeth,” “The Golden Age” covers the height of her rule and the problems she faced, but nowhere near as successfully, either as a sequel or as a film in its own right. As a historical reenactment it suffers from a great deal of simplification in order to make complex events quickly and easily understandable, and as a drama it suffers from a great deal of build that never really pays on it’s promise. Cate Blanchett is still as good as ever as Elizabeth, easily portraying both her icy charm and the vulnerable woman beneath it that she can never afford to let out. As with the original, director Shekar Kapur explores that particular side of her personality via the relationships she had and almost had with the men around, personified in “The Golden Age” in the form of Sir Walter Raleigh (Clive Owen) an explorer and pirate that tickles her fancy with the freedom she can never have, and manages the difficult feat of being simultaneously loyal and selfish and still likeable all the while. She wants to be with him, but knows she can’t, and instead shackles him with duty because she can’t bear for him to leave or be with anyone else. The arbitrariness of monarchy is in full display, both in the court of Elizabeth, and her rival Philip of Spain, who is willing to bankrupt his country to fuel his vendetta against her. Philip’s also the prime example of what’s wrong with “The Golden Age” and why it only partially works; he’s both oversimplified and extremely over done. He signifies the Catholic opposition to Elizabeth and Protestant England, but he does so with a mindless, religious fervor, showing up only occasionally to almost literally twirl his mustache and make vaguely menacing statements about Elizabeth’s forthcoming destruction. He’s been crushed into the mode of a classically vague screen villain that actually takes more away from the film than it adds to it. And that translates to all the film’s antagonists  the heroes are somewhat complicated, but the Catholics all tend to be one-dimensionally single-minded. It’s also interesting that  besides her relationship with her lady-in-waiting Bess (Abbie Cornish), a lot of which revolves around advice about men  Elizabeth, the strong, independent Queen with no master, is defined almost entirely by her relationships with men. Besides Raleigh, there is a contentious, almost father-daughter relationship with her aging spymaster Walsingham, still ably played by Geoffrey Rush but with unfortunately not enough to do, and her reliance on her spiritual advisor Doctor Dee (David Threlfall), one of the few areas of the film that works completely in and of itself. Though he doesn’t appear in near enough of the film, the few Doctor Dee scenes are among the best. 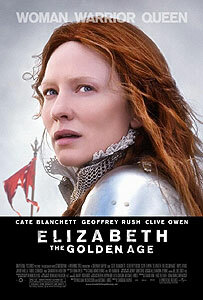 The highlight, of course, is the near invasion of England by the fabled Spanish Armada, and desperate defenses against it, leading up to Elizabeth’s justly famous ‘Speech to the Troops at Tilbury.’ Unfortunately, like a lot of the film, the moment is over-staged and overplayed by Kapur, who seems intent on creating an icon out of Elizabeth through constant shots of her bathed in light, the camera revolving around her in slow motion. Kapur is such a talented director, it’s a double shame he’s reduced himself to such ham-handed methods in order to create the emotional response he’s looking for. It’s so overdone it’s off-putting. Kapur and Blanchett are just too good at what they do for “Elizabeth: The Golden Age” to be a bad film, but for all it’s strengths, it’s got too many weaknesses to be more than decent.